A. If big burgers are your thing, be sure to try "The Budget Burger" (NT$340). Once again, N Plus presents a dish that screams big American BBQ flavor. It also includes nice Tex-Mex touches with a bit of spiciness. 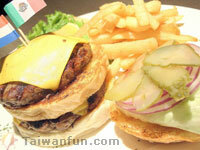 Like most burgers, it is accompanied with good, tasty fries and is more than enough to satisfy Taipei's big eaters. B. 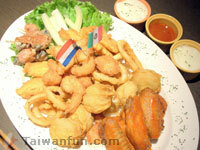 You may want to start your meal off with the New N Plus Appetizer Sampler (NT$480). This monster combination contains veggies wrapped in bacon, fried shrimp, bits of lamb, fried fish, fried crab, mushrooms and, of course, buffalo wings. After sinking my teeth into the wings, I had the sudden urge to grab a beer and play darts. These are not on the menu yet and you'll have to ask for them. In fact, they're still perfecting the ingredients. Also keep in mind that they make their own sauces to accompany the meal--I suggest trying the lemon sauce which, according to the owner, is a hit with the ladies.